After reading this book, only the most unadventurous reader would turn down the chance to see Wagner's masterpiece. [Scruton] lays out his argument in a clear, coherent, and readable manner. . . . An admirable, welcome effort to illuminate one of the most significant artistic achievements of the modern age. Definitive . . . Scruton's presentation is grounded throughout in a deep understanding of the culture of Wagner's era . . . the writing is clear and persuasive . . . Highly recommended without reservation to the cognoscenti, who will profit enormously from this impressive scholarship. Roger Scruton has long been known as the philosopher who focused his penetrating and immediately accessible insights on all manner of the arts. While Wagner's Ring Cycle is widely reputed as "difficult" and murky, Scruton reveals it in such a way, act by act, to make it seem entirely understandable and I must say, far more appealing to me. So far, I have found the Ring a hard work to enjoy thoroughly as I do Parsifal or Tristan. There is also much to offer here for well-seasoned Wagnerites who need no convincing of the importance of this masterpiece. What Scruton does is reveal the great spiritual accomplishment that is the Ring, even despite Wagner's efforts to move society beyond religion. First reviews that I read made knee-jerk assertions that Scruton white-washes Wagner's anti-semitism. I didn't find that at all the case after reading this. It fully embraces Wagner as an ill-behaved and sometimes callous man who was one the greatest and deepest geniuses of the last 200 years for the reasons clearly illuminated throughout. Scruton wisely doesn't believe anti-semitism can entirely define someone. While the modernist wishes they could dismiss anyone who receives PC demerits, thankfully Scruton looks at the whole man here. I loved this work and any music lover should count this as a top ten book along with Charles Rosen's and Letters of Mozart. 4.0 out of 5 starsHow music and philosophy come together in Wagner's Ring. This is not bedtime reading. I don't know much about music, so unfortunately the technical parts the music were lost to me. But I did understand what he was getting at saying words and story are not adequate to understand the Ring, rather the music raises the unconscious archetypes and myths we carry and make the opera interesting and complete. I went to youtube to listen to the leitmotifs that Wagner used to signal something at various point in the work, like the innocent nature of the Rhine-daughters or the recurring theme of Alberich's renunciation. I am familiar enough with modern German philosophy that I fully enjoyed Scruton's analysis of the threads of Wagner's story. I appreciated that Scruton took the time to explore alternative views. 4 stars is a pretty good rating for me, one of the top handful of books this year. 5.0 out of 5 starsScruton, in excelsis! The Ring Of Truth is a superb work of criticism in the best tradition. But it is also unique, because it encompasses the identification of themes in the cadence of a major work of music alongside what is deeply buried in its conception for the delight of all of us. Scruton is a conductor, leading us to appreciate the great music while unearthing the mythology which is an integral part of The Ring. Great, great work! 4.0 out of 5 starsWell written and insightful. 5.0 out of 5 starsOutstanding analysis, elegantly and densely written. Outstanding analysis of Wagner's Ring. I'll refer to it often in the years to come. 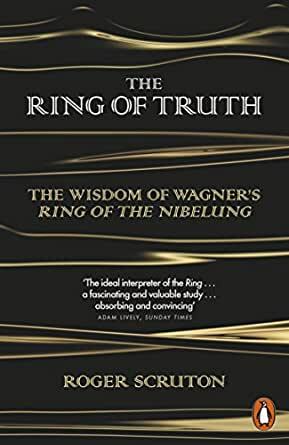 The author is an excellent writer who fully appreciates the totality of the Ring Cycle and articulates the elements of the piece that keep Wagner-lovers enthralled. I highly recommend it to any Ring fan.